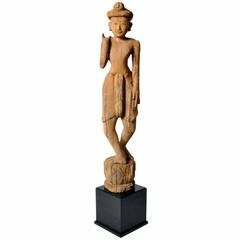 This hand-carved sculpture is from Chiang Mai, Thailand and was made from teak wood, circa 1980. The sculpture features a scene of elephants grouped together which has been mounted on a black metal stand. Italian ceramic animals sculpture of an elephant in the style of Bitossi. Measures: Height 23 cm. Width 34 cm. Depth 17 cm. A 19th century wood carved pair of Asian elephants purchased in the 1930s. circa mid-1800s.